The view from the balcony this morning revealed another mercurial change in the weather, last night's cold and calm weather had been replaced by high winds and driving wet snow. 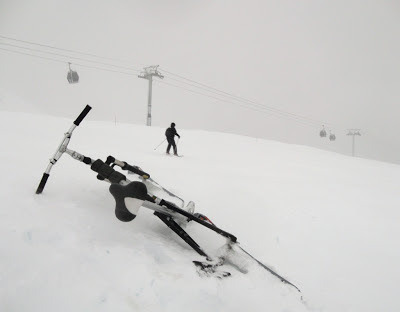 The wind had shut a great deal of the lift infrastructure, including our favourite uplift, the DMC Grandes Platiers gondola, this left only the Aup de Veran gondola for us skibikers to use. Carl and Andy put in a couple of runs before calling it a day! Young people, no stamina. To be fair they had both busted themselves up a fair bit in recent days, whilst I ambled along whistling a merry tune surfing in their rapidly receding wake. I was determined to make the most of the deteriorating conditions, stubbornly determined to continue till the lifts closed regardless. I enjoy a freakish thrill to be out in wild weather, after all this was like a fine summers day in Scotland, or as Carl would say "Bring it on". From the top of the Aup de Veran, there are quite a few options for descent, but given the poor visibility and ensuing tempest, I took a safe option and stuck to a well known blue run. Running over the same run time and time again may seem tedious to some, but there was an element of "method in my madness". If you learn the nuances of a familiar run, to the point where you remember all the bumps, dips, icy patches and soft spots then should whiteout occur you stand a better chance of making it to the bottom unscathed. I chose to capture the moment on camera, removed a glove and took three quick shots, two were nothing but a sea of whiteness, the snow was covering up the lens in less time than it took to read this sentence. I put the camera quickly back in the safety of my ruck sack but struggled to refit the glove. The wind chill had reduced it to a lump of inert frozen meat, I smacked it roughly to stimulate some blood flow and somehow got in encapsulated, I then rode quickly down to the shelter of the valley. I managed one final run before the lifts were closed prematurely.